Individual Savings Accounts, better known as ISAs, provide a simple, tax-efficient instrument for both saving and investing, so the link to retirement planning is a natural one. The question is: are they the right option for you? Of these, the cash ISA is the most popular. Offered by banks and building societies, it has much the same functionality as a typical savings account (with the choice between easy access and fixed-term options). The key difference is that savings interest earned within a cash ISA is tax-free (on contributions up to the annual ISA allowance of £20,000). A stocks & shares ISA enables you to make a range of investments and shield any gains from tax. These ISAs are usually managed by a broker, a fund manager or investment platform, although it must be remembered that this type of ISA carries a lot more risk than a cash ISA, in that the value of investments can go up or down. The Innovative Finance ISA (IFISA) is a wrapper offered by peer-to-peer lending (P2P) platforms, who match the funds invested by lenders with borrowers in need of a loan. Courtesy of the IFISA, the interest earned on these loan repayments can also be protected from tax. Although there is no Financial Services Compensation Scheme protection in the event of capital loss, P2P is widely accepted as having a lower risk profile than stocks & shares, and platforms typically take robust steps to mitigate risk. The Help to Buy (H2B) ISA and the Lifetime ISA (LISA) offer a 25 per cent state-sponsored bonus on contributions, with both being geared towards first-time buyers. However, the LISA offers greater flexibility, in that the bonus isn't only activated upon the purchase of a home, and can also be cashed out at the age of 60 to help fund retirement. Junior ISAs can be opened by parents on behalf of their children if they are under the age of 18. As is the case with the Lifetime ISA, the Junior ISA has both a cash and stocks & shares element, with tax-free savings interest or investment gains. The core benefit ISAs bring to the table is tax-efficiency. Savings interest and investment earnings can be shielded from income and/or capital gains tax, and, unlike a pension, withdrawals from an ISA are not subject to a tax charge either. Furthermore, although there is an annual subscription limit of £20,000 across the various categories of ISA (for the 2018/19 financial year), there is no limit to the amount you can transfer between ISAs when it comes to contributions from previous tax years. So, for example, if you've saved £100,000 into a cash ISA over the past decade, but wish to seek better returns in an IFISA, you can arrange for your ISA manager to transfer some or all of it across in one go. ISAs, for the most part, are also user-friendly. Cash ISAs mirror savings accounts in their structure, and are therefore particularly easy to open, easy to manage and easy to understand. IFISAs, too, are typically an extension of an ordinary P2P account, and carry negligible additional complexity. Stocks & shares ISAs are more diverse, and there is some variance from a setup point of view between providers. However, allocating capital towards various investments is usually done online, and, for seasoned investors, the process is considered to be very straightforward. There are some additional rules and limitations which apply to H2B ISAs, LISAs and Junior ISAs, but all of them can be opened quickly and easily. Are ISAs suitable for saving in retirement? ISAs are an excellent supplementary tool to a pension when it comes to building up - and maintaining - your retirement pot. It is true that cash ISA rates have dropped off significantly since the 2008 financial crisis. However, there have been signs of recovery of late, and you can fetch up to 1.38 per cent in an easy access cash ISA at present, while if you're willing to lock your money away for a year, that rises to 1.55 per cent. If you're setting aside money for a savings account anyway, the benefits of a cash ISA aren't merely a modest rebound in rates. Putting money into a cash ISA will also give you the flexibility to transfer your money to a different category of ISA at a later date if you wish; perhaps in pursuit of better returns, or a Government-backed bonus. Equally, if you're planning to use the earnings from investments in stocks, shares, investment funds, bonds, property or unit trusts as an income in retirement, it makes sense to use the vehicle of a stocks & shares ISA to maximise tax efficiency. For example, outside an ISA, the annual capital gains tax allowance is limited to £11,700, while dividend income above the current threshold of £2,000 is liable for tax. And, unlike a pension, withdrawals down the line are tax-free. In fact, they don't even need to be entered on your tax return. IFISAs are also proving to be a popular choice among retirees, for a number of reasons. Peer-to-peer lending has developed a reputation for steady returns, usually in the region of 5-7 per cent, and the tax benefit of earning this through an IFISA means more pennies in the pocket. In addition to that, IFISAs provide an automated mechanism to take repayments on your loans as an income direct to your bank account (usually free of charge) - ideal for those in retirement looking to boost their income. As for the LISA, the key benefit for retirees is the aforementioned bonus. Although you have to be between the ages of 18-40 to open a LISA, you can contribute to the account up to the age of 50. Given that you are able to contribute up to £4,000 each tax year into a LISA (and therefore accrue an annual bonus of up to £1,000), it means that you could be in for a bonus windfall of up to £33,000 when you are eligible to access the funds at the age of 60. ISAs clearly have tangible benefits compared with a pension, especially for those approaching, or who are already in retirement. Chief among these is that when drawing down a pension, only the first 25 per cent of the amount withdrawn is tax-free, with the rest subject to the person's marginal rate of income tax. Also, you don't have to wait until the age of 55 to access money within most types of ISA (in the way that you are obliged to with pensions), and there is thus a big tick in the box when it comes to accessibility and flexibility. Nevertheless, the pension remains a cornerstone of retirement planning, and for good reason, given the ability to make pre-income tax contributions (known as pension tax relief), and employer contributions in the case of workplace pensions. As such, those considering reducing/halting contributions into a pension in favour of ISAs should proceed with caution. In most cases, pensions will still provide the most effective means of building up your retirement pot, despite taxation upon drawdown. ISAs still have a vital role to play in retirement planning, and you should look to capitalise on the benefits they can offer as much as possible. However, if it means cannibalising pension tax relief and/or employer pension contributions, then it could well be to your detriment. Instead, ISAs and pensions should sit alongside each other, and work together to ensure you have ample financial ammunition to enjoy the golden years you deserve. You can hold any number of ISAs at a given time, but you can only subscribe to one ISA within each category in a given tax year. The three standalone categories of ISA are the cash ISA, stocks & shares ISA and the Innovative Finance ISA. The H2B ISA falls under the umbrella of cash ISAs, while the LISA (and Junior ISA) can come in the form of a cash or stocks & shares ISA. Your annual ISA allowance of £20,000 can be spread across one or more of these ISA categories, provided you do not subscribe to more than one ISA provider within the same category, as articulated above. How much can I withdraw from an ISA? It very much depends on the type of ISA in question. For example, in the case of an easy access cash ISA, you can withdraw as much as you like (and as often as you like). However, there will be certain limitations imposed on limited access or fixed-rate cash ISAs. You can also withdraw freely from H2B ISAs, although this could affect the total bonus you receive, which is only activated upon completion of the sale of a house. With stocks & shares ISAs, you are free to withdraw cash from them. It should just be noted that, if you decide to reinvest some or all of that money later in the tax year, it will count towards your ISA allowance. You can usually access capital invested within an IFISA at any time too, although if this is prior to the loan(s) maturing, you will likely incur a small fee for doing so. However, you can usually direct interest and the capital portion of the monthly repayments you receive to your bank account, free of charge. As for the LISA, there is a 25 per cent penalty on the amount withdrawn (ie: forfeiture of your bonus, plus interest) if you withdraw from it prior to the age of 60. The exceptions are if you are withdrawing to fund the purchase of a first home, or if you have a terminal illness, with less than 12 months to live. As of April 2016, some cash ISA providers have started to offer 'flexible' ISAs, which allow you to withdraw money from your ISA, and then later replenish that amount without the subsequent payment counting towards your annual ISA allowance. In some cases, this can also be applied to money held in old cash ISAs. Some IFISA providers offer flexible ISAs, while cash held within a stocks & shares ISA can also be flexible - subject to the provider offering such a facility. Does the Personal Savings Allowance nullify the benefits of a cash ISA? The Personal Savings Allowance (PSA) means those in the basic-rate tax bracket can shield up to £1,000 in savings interest from tax each year, while for higher-rate taxpayers, the level of relief drops to £500. Given the low rates currently being paid out on most savings accounts, it would require a lot to be contributed before interest earned becomes taxable. That said, the PSA does not apply to additional-rate taxpayers, so the cash ISA still provides a useful layer of protection for these individuals. And it should be remembered that, if you wish to transfer monies from a cash ISA to a different ISA category in later years, there is no upper limit when doing so. Is the IFISA ideal if I'm already retired? As mentioned above, borrowers make repayments on P2P loans on a monthly basis, and you will usually have the choice of taking interest (or capital plus interest) as a direct, automated payment to your bank account. As the loans are repaid at a fixed rate, you will therefore also have the benefit of knowing how much you can expect to be paid each month from your investment. However, you should bear in mind that taking repayments as income, rather than reinvesting them, will mean you do not maximise the overall return on your investment. Also, despite the excellent performance of leading P2P platforms, returns are not guaranteed, and your capital is at risk. How much should I pay into a pension? There is no precise answer to this question, but, if you have a workplace pension, you will be required to contribute at least 5 per cent of your salary from April 2019 under auto-enrolment rules. In turn, your employer is obliged to contribute at least 3 per cent of your earnings to your workplace pension. You are able to opt out if you wish, but doing so would forego what effectively amounts to free money from your employer. You can contribute as much as you earn into a pension, up to the annual allowance of £40,000. For workers who are higher-rate taxpayers, but expect to be basic-rate taxpayers in retirement, pension tax relief offers the most significant potential gains, relative to current income. Is the annual ISA allowance going to increase in future? It's highly likely, but the extent to which this will be the case is hard to say. 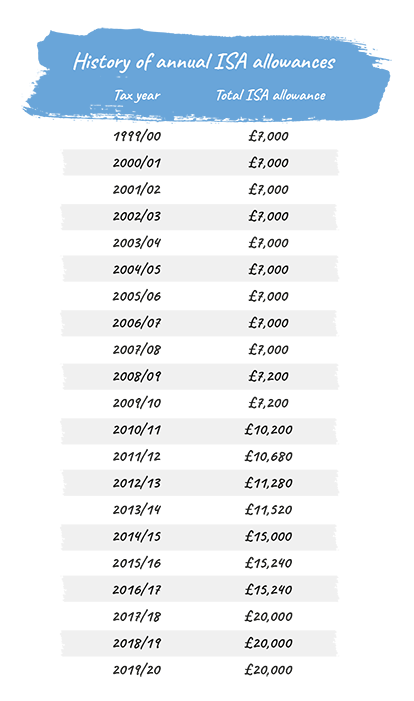 The ISA launched in 1999 with an annual limit for subscriptions of £7,000, although the first increase only arrived a decade later. However, it has risen steadily since 2010, and in 2017/18 it recorded its biggest jump of all from £15,240 to its present level of £20,000. The ISA allowance is set to remain at £20,000 for a third year in a row in 2019/20, and the Chancellor has not yet given any indication as to whether this threshold will be revisited thereafter. However, based on historic data, it seems a reasonable assumption that the ISA allowance will continue to follow an upward trajectory. Are ISAs on the decline? Could a Care ISA ease the social care problem?